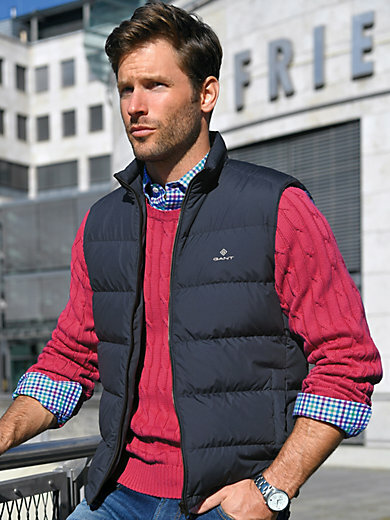 Quilted down gilet by GANT: this lightweight design is guaranteed to be a handy companion all year round! Made from top-quality hard-wearing microfibre with GANT identity embroidery at the front, a high-closing zip and 2 zipped pockets. Filling in 90% down, 10% feathers. Outer material and lining in 100% polyester. Length approx. 67cm/27ins. The quilted down gilet is machine washable. Sizes: 48 (S), 50 (M), 52 (L), 54 (XL), 56 (XXL), 58 (XXXL).